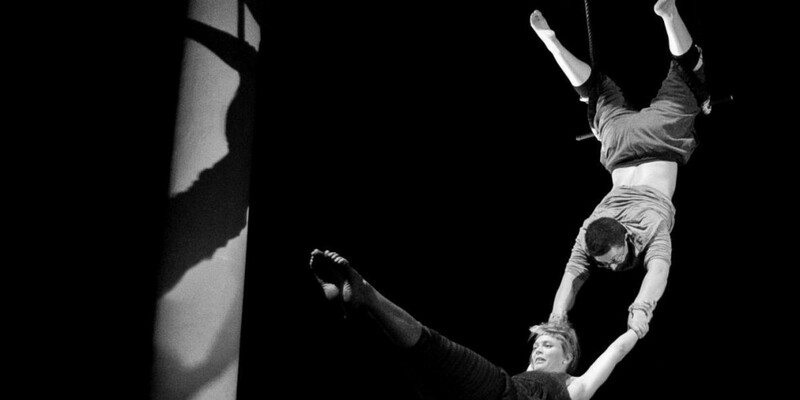 Join MCP as he offers a run of classes in Doubles Trapeze! He shall cover basic moves in catchers, ways for the flyer to mount the bar at height, basic sitting tricks and ways for the flyer to remount the bar with the base sitting, ways to swap roles and tricks that have the flyer as the base. "What I want the students to get out of the classes is the basic structure of a doubles trapeze routine: tricks under the bar, then mount the bar into base and flyer sitting, do some tricks in sitting while the base recovers and then do some more tricks in catchers before dismounting. If we can get that far then great, after that, we can add in whatever the strengths of the participants are"
Clothing: Flyers and bases should wear tight aerial appropriate clothing, and remove watches and wrist stuff and big earrings. Flyers can have booties / gaiters. Anyone who wants to hang around in catchers for a long time, I would recommend tights then jeans or jeggings, but jeans without a belt and a zip closure, or drawstring and for them to be a bit stretchy. A kind of jean/jegging hybrid really. For certain tricks, everybody is going to need to get their calves out.